This Friday I’m leading a blogging workshop at the Jot Writers’ Conference here in Grand Rapids, Michigan. This will be the third time I’ve headed (or co-headed) a session on this topic and I often feel unequipped. I don’t have troves of people flocking to my blog. I don’t know how to monetize with advertisements or get the GoodReads widget to work correctly or how to write html code. When I think about it, I’m not all that great of a blogger…and I usually don’t even call myself that. Susie: Wife, Mother, Novelist, Coffee drinker, Chocolate inhaler, Laundress, Cook…but I wouldn’t add “blogging” to my list of credentials. Yet, on the Jot site, they called me a “prolific blogger“. Talk about pressure! I mean, when I think of the word “prolific” I think of Stephen King’s mountains of 800+ page novels or Shakespeare’s list of words he made up. Prolific is a HUGE word. And it’s a word that probably means more than I give it credit for. It means a person, plant, or animal that produces a lot of foliage, offspring, or fruit. Well, I mean, these eyebrows could count as foliage…just ask the lady who waxes them (amiright, Sarah?). And I’ve got 3 kids…somedays that feels like a lot of offspring. And fruit. Hm. 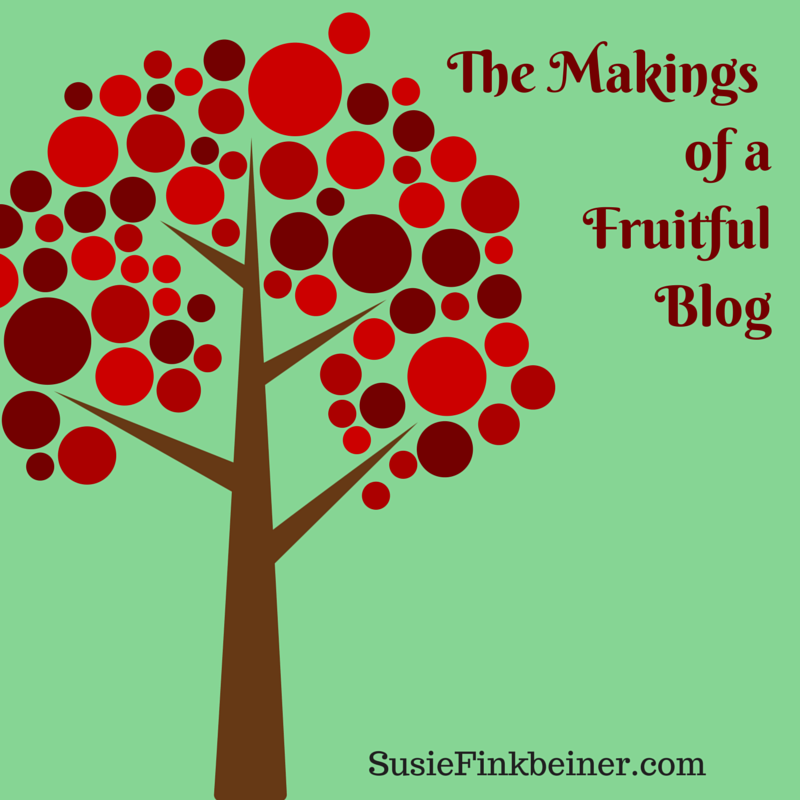 What’s the fruit of my blog? I could mention the month of short stories (anybody remember that crazy challenge?) or that I got in touch with my first publisher (WhiteFire) because one of their editors read my blog. Or I could go digging and find out how many posts I’ve written. But that’s not the fruit. Not really. I mean, they’re benefits. They are results. The fruit, as far as I’m concerned, has more to do with people. With you. I feel like I’ve made some great connections with readers, other writers, friends through this silly little blog. That’s really why I keep blogging. For the conversations we have, the support we can lend one another. My workshop this weekend is called “Thriving in the Blogosphere”. You know how I’ve thrived? How I’ve survived? And I wanted to tell you thank you. You mean so much to me. I’d love for you to come to Jot this weekend. It’s open to anyone! And it’s FREE. All you have to do is call Baker Book House to RSVP at 616-957-3110. I hope to see you there! Great post, Susie! I’m happy to count myself among your readers. And I look forward to your session at Jot! Thanks, Josh! Can’t wait for Friday! Same here. If I wasnt doing a workshop also I’d be there! Funny. I was thinking that I wanted to go to your workshop! Well, Miss Susie Q, you can teach me about blogging Friday night then! See you at Jot! I’m so excited that you’re coming! I’ll see you there, Susie! I’m looking forward to my first Jot Conference. Oh yeah! I’m so excited that you’re coming, Jane!